11...¤xd4 It is also possible to move the rook on d8 right away or in a move. 12.¤xe4 Јg6 13.Ґxd4 ¤c6 14.Ґxb6 axb6 15.Јd2 Јf5 Leko is the first to turn off the theoretical roads, protecting himself from an unpleasant threat of Јd2-f4. Previously it occurred15...¦a5 16.Јf4 ¤e5 17.¦ad1 f6 18.b4 ¦a8 19.¤g5 White's activity looks threatening, but 19...Ґg4 (19...c6 also seems not losing) 20.¦d2 ¦fe8 (the important thing is not to "blunder away": 20...¦ae8?? 21.¦xe5! 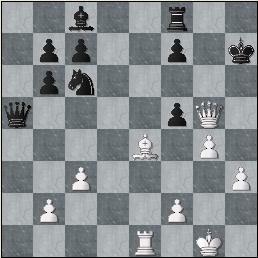 Rublevsky-Sasikiran, Khanty-Mansyisk 2005) 21.Ґd5+ ўf8, although seemingly risky, appears quite acceptable for Black. 16.h3 h6? 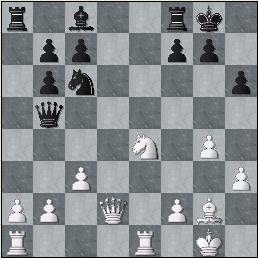 In this way Leko prepares Ґc8-e6, but this move turns out to be a serious mistake. 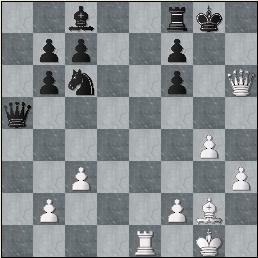 On16...¦d8 White can retain a slight initiative by way of 17.¤g5! ?, so it is necessary to move the bishop on e6 at once: 16...Ґe6 17.¤g5 ¦ad8 18.Јe3 Ґd5, solving the opening problems. 17.g4 Јb5 The retreat 17...Јd7, trying to "bluff his way out" due to an idea of f7-f5, is too clumsy, dangerous for Black are both "automatically evident" 18.¤f6! gxf6 19.Јxh6 and more modest 18.Јf4 f5 19.¤g3 (19.Ґf1! ?is dubious because of 19...g5!) 19...fxg4 20.Јc4+ ўh8 21.¦ad1; 17...Јa5 will be met by way of 18.b4; 17...Јe5, with an idea to provoke f2-f4, which will deprive the white queen of the f4-square is, of course, can be recommended, but I wouldn't like to be responsible for such a recommendation. A position on the diagram will do for a "Bluff-club" TV show. 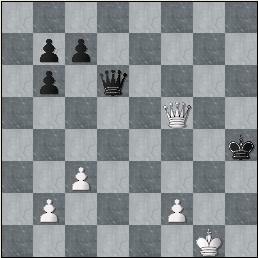 So... Do you believe than only in a couple of moves White will develop dangerous threats to black king? Oh, you don't?! And you are wrong! 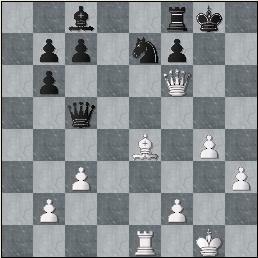 24.¦d1 Ivanchuk forces a draw. To the same outcome leads also24.Ґc2 ¤g6 25.Ґxg6 fxg6 26.Јxg6+ ўh8=. But the victory still seems attainable! After 24.Ґh7+! ўxh7 25.¦xe7 Јd6™ 26.¦xf7+ ¦xf7 27.Јxf7+ ўh6 28.g5+ (28.f4 Јd1+=) 28...ўxg5 29.Јg8+ ўh4 30.Јh8+ (30.Јxc8 Јd1+ 31.ўg2 Јd5+=) 30...ўg5 31.h4+ (31.Јxc8 Јd1+=) 31...ўg4 32.Јxc8+ ўxh4 33.Јf5! Forced variation leads to a queen ending in which Black's problems are, in my opinion, far from being over due to a constant threat of queens exchange.